A Foot First Aid Kit Will Keep Feet and Ankles Safe and Healthy — Podiatry Group of Annapolis, P.A. Your feet and ankles are among nature’s miracles. Each foot is made of 26 bones and nearly 100 muscles, ligaments, tendons, and other soft tissues, all working together to form the arches and joints that allow you to stand and walk upright without pain. Of course, a structure so complex is vulnerable to illness and injury. Whether at home or on the road, a foot first aid kit is the key to preventing problems and managing small issues. Creating such a kit is an easy, inexpensive project. Start with everything you’ll need to handle small injuries. Be sure to add some alcohol wipes, antibiotic ointment, and a handful of adhesive bandages in different sizes. You’ll need tweezers. They are essential for removing foreign objects, such as splinters, or small fragments of glass. 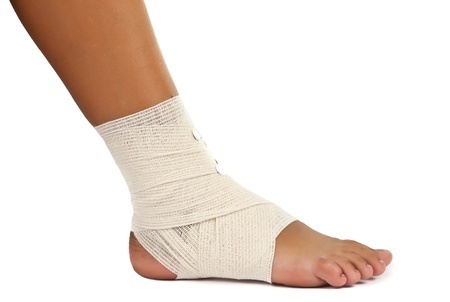 Wrap bandages are key in case of a fall or possible sprain. They will immobilize your ankle until you can get to the foot doctor. Swelling and bruising can be limited when you are able to apply cold compresses to an injury quickly. Put a couple of instant cold packs in your kit so that foot and ankle injuries can be treated immediately. Blisters hurt. They can be prevented or mitigated with moleskin or another blister pad. Be sure to include scissors so that you can cut your padding to the right size. What if you have a toenail that is unexpectedly rubbing against your shoe? If you add a clipper to your pack, you can trim it on the fly, possibly preventing ingrown toenails. Finally, be sure to add a laminated card with your podiatrist’s office number to your foot first aid kit. If illness or injury strikes, you’re going to want to call as soon as possible. If you are concerned about the health or well-being of your feet, ankles, or lower legs, a visit with a board-certified podiatrist like James M. McKee, DPM, FACFAS is the first step to recovery. Schedule a convenient appointment in our modern, comfortable office on Solomons Island Road today. Call the friendly Podiatry Group of Annapolis, P.A. staff at 410-224-4448 or click here to get started today.